After a decade, Tyrone have returned to an All-Ireland football decider. Tyrone's Gavin Devlin celebrates with manager Mickey Harte after the game. 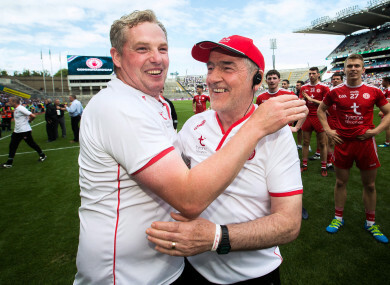 SINCE TYRONE LAST scaled the Gaelic football summit in 2008, they have ventured back to Croke Park on four occasions in search of a berth in the September decider. Cork in 2009, Mayo in 2013, Kerry in 2015 and Dublin in 2017 put paid to the dreams held by Mickey Harte’s teams. Their All-Ireland semi-final record was developing into a pattern of losses and disappointments. To correct that trend yesterday brought natural delight and also a sense of relief as they held off Monaghan to prevail at the final whistle. “If you have been in four semi-finals and go home with nothing to do for the next month only watch other teams go for it, there is an awful sense of anti-climax. “We know the people of Tyrone. They love their football and love to get energised by it. And we felt for the last number of years that we kind of let them down somehow. They just wanted to express themselves in terms of being here on All-Ireland final day. “Maybe we got a wee bit spoilt with three in five years in the noughties. But still there is a longing in the people of Tyrone to be here on All-Ireland final day. “And we always felt we were playing for them. That’s what we do it for. We don’t do it for ourselves. We do it for those good people who travel miles and miles to support it; people who have family issues where football brings them some consolation. “So it’s not just about Gaelic games or about playing football. It is about the well-being of the people in your county. I feel for Monaghan, of course, because we have been there four times in the last five. “We have lost our previous four so we are well aware of how they feel and I have to empathise with them about that, but we needed this so badly. “Ten years is a long time and on our fifth attempt to get to the final we felt as a group we needed to be in this final. Thanks be to God we are there. Harte knows that a semi-final success cannot be dwelt on. He has an unblemished record from final appearances with those victories in 2003, 2005 and 2008 but the scale of the challenge presented by Dublin is clear. “We can’t be too pleased about all of that because getting to a final is one thing,” admitted Harte. “There is something to be won in the final and we have to knuckle down to do our very best to make a game of this final. “The public need it and Tyrone people need it to make us take a bite at this final. We haven’t great memories of our semi-final against Dublin here last year so we need to be so much better than that. “If we are it should be a much better game and who knows what could happen? We didn’t read a 12 point defeat into that match last year. A lot of people did and a lot of people reminded us of it for the last twelve months. “But we didn’t feel we were twelve points a worse team than Dublin with that result. Neither do we feel necessarily a three point (worse) team to Dublin because of what happened in Omagh. “There are different scripts, different days, different everything. This is a new game and a new situation whereas Dublin are so comfortable having been there so often. Email “Mickey Harte: 'There is a longing in the people of Tyrone to be here on All-Ireland final day'”. Feedback on “Mickey Harte: 'There is a longing in the people of Tyrone to be here on All-Ireland final day'”.